For many of us dealing with soy or gluten allergies, delicious Asian cuisine can pose a challenge. Coconut Secret to the rescue! Operating out of Mill Valley, this local company utilizes the naturally sweet “sap” collected from coconut trees in the Philippines to make snack bars, sauces, sweeteners, and frozen desserts. Their new Coconut Aminos Teriyaki and Garlic Sauces add amazing taste to your dishes, as well as beneficial nutrients and amino acids to your diet. Read on for more coconut secrets. We spoke with founder Leslie about the origins of Coconut Secret and what makes these new sauces unique. Mollie Stone’s (MS): When did you start Coconut Secret? Why did you choose coconut as the base for your products? conversation I had with our mom who is diabetic. She said, “The food that I miss the very most now that I am diabetic are my Mounds Bars!” That comment sparked the seed in my mind to develop a clean, organic low-glycemic healthy version of a Mounds Bar. Our first product was initially going to be what is now our Classic Coconut Bar. However, as the recipe was being developed, it became obvious to me that we needed to switch the from the agave syrup that we were originally using as our sweetener to a different liquid sweetener, due to the new findings that so many of the agave syrups on the market were adulterated with high-fructose corn syrup and were exceedingly high-glycemic. At that point I did not trust any agave syrups, so I went on a world wide search for another low-glycemic liquid sweetener. That is when I discovered the many traditional products made from the “sap” of the coconut tree. It soon became evident that we needed to educate the public on these products first. Rather than coming right out on the market with our line of chocoloate covered coconut bars, we came out with our Coconut Aminos Vinegar, Nectar, and Crystals, all made from coconut tree sap. Our line of snack bars were finally introduced into the marketplace a year later. MS: What exactly is coconut sap and how it is used in your sauces? What are the benefits of your sauces vs. regular soy/teriyaki sauce? A tapper hard at work. L: Most people don’t realize that you can tap a coconut tree for its sap, much like you would tap a maple tree. The noteworthy difference is that the sap comes right out of the tree already tasting sweet, so it does not need to be boiled for 24 hours to bring out the sweetness like maple syrup (or 36 hours for agave syrup.) 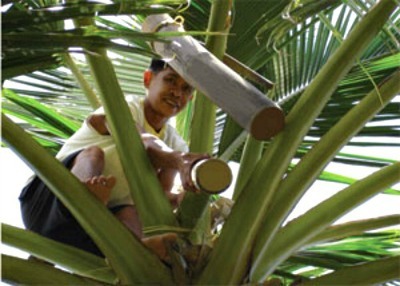 The sap of the coconut tree is the lifeblood of the tree that feeds it the nutrients that it requires to grow coconuts. It is exceedingly nutrient-rich and chock full of amino acids, full-spectrum B vitamins, abundant Vitamin C, minerals, and has a nearly neutral pH similar to mother’s milk. The sap is used as the base ingredient for our new Coconut Aminos Teriyaki and Garlic Sauces. These are the first ever soy-free Asian style sauces on the market. A large percentage of the population are dealing with allergies to soy, and soy is also avoided on all gluten-free diets as well. These products fill a much needed void for people who are searching for a soy-free alternative for their Asian cuisine. 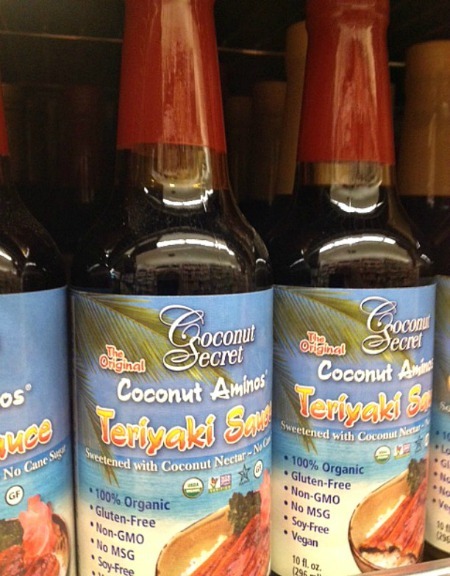 MS: What are your favorite ways to use Coconut Aminos Teriyaki and Garlic Sauces? L: These delicious sauces (in addition to our original Coconut Aminos soy-free sauce alternative) can be used in sautés, marinades, dressings, for glazing, broiling, or as a dipping sauce for sushi.